“From that point, this has truly been a campus-wide collaborative effort, which was the key to our successful proposal,” he said. Campus units that assisted include the Office of the Chancellor, Office of Academic Affairs, Office of International Programs, the College of Arts and Sciences, the Department of Mathematics and Statistics, the Office of the General Counsel, and the Office of the Registrar. Beginning in fall 2018, UNCW and CUAS will offer a 3+1 degree program in mathematics to CUAS students. The students will spend three years at their home institution focused on mathematics and data science. They will begin their final year at UNCW, where they will continue their studies and sharpen their academic English skills. About 100 CUAS students are expected to participate annually. As part of the collaboration, UNCW students and faculty will have opportunities to study or teach at CUAS. International collaborations like the 3+1 program increase student and faculty mobility and present new opportunities for research and discovery that benefit both institutions. “Both CUAS and UNCW have talented students and strong professors. This is a great combination for this program in data science and other applied mathematics,” said Wenli He, vice director of Chinese-Foreign Program Management Committee at Chongqing University of Arts and Sciences. The dual degree program supports UNCW’s commitment to global learning and research through international collaborations as outlined in its Strategic Plan. 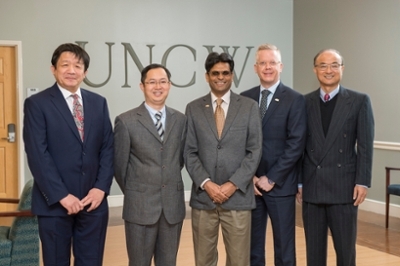 Pictured from left to right: Xin Lu, UNCW Department of Mathematics and Statistics faculty; Wenli He, vice director, Chinese-Foreign Program Management Committee, Chongqing University of Arts and Sciences; Aswani Volety, College of Arts and Sciences dean; Michael Wilhelm, Office of International Programs associate vice chancellor; and Zhuan (John) Ye, UNCW Department of Mathematics and Statistics chair.